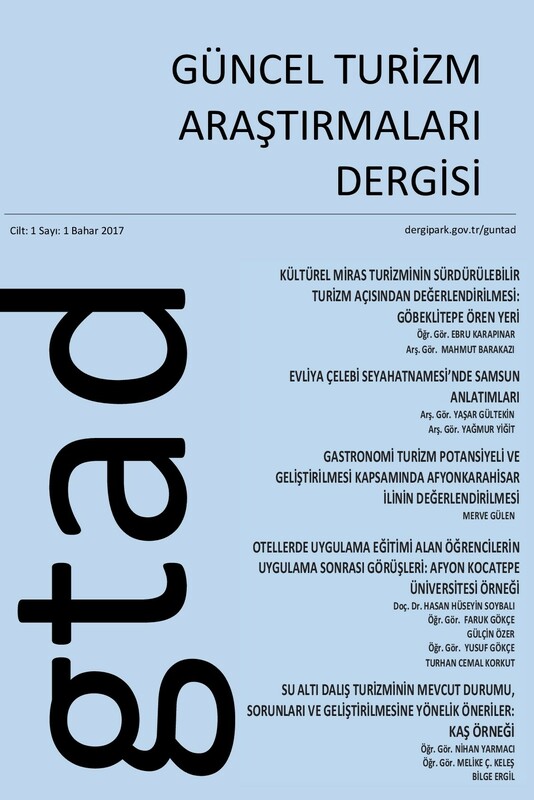 Journal of Contemporary Tourism Research is an open access, double blind peer-review journal published in Turkish. It aims publishing high quality research studies in all related areas of tourism. The scope of Journal of Contemporary Tourism Research encompasses theoretical and empirical research articles, reviews, scientific commentaries in the fields of tourism including innovative ideas and detailed contributions from other directly related fields. Journal of Contemporary Tourism Research is committed to maintaining the highest standards of publication ethics and to supporting ethical research practices and adheres to the COPE Code of Conduct for Journal Publishers. The journal editors follow the COPE Code of Conduct for Journal Editors. Journal of Contemporary Tourism Research is published biannually (2 issues per year) in online. Journal of Contemporary Tourism Research is published only in Turkish language. However, each paper contains “title, abstract, and keywords” in English. Journal of Contemporary Tourism Research operates a double-blind peer review process. All manuscripts submitted to Journal of Contemporary Tourism Research are evaluated using the following steps. Journal of Contemporary Tourism Research uses double-blind review, which means the identities of the authors are concealed from the reviewers, and vice versa. Each paper is initially assessed by the editor for suitability for the journal. Papers deemed suitable are then typically sent to a minimum of two independent expert reviewers to assess the scientific quality of the paper. Reviewer selection is critical to the publication process. Therefore, reviewers are matched to the paper according to their expertise. Reviewers should bear in mind that all manuscripts contain confidential information, which should be treated as such. All submissions are evaluated based on several factors, including originality, adequacy of methodology, analysis and interpretation, ethical issues, contribution to the literature, and quality of communication. Typically the manuscript will be reviewed within 60 days. If necessary, revised manuscripts as well as the response to reviewers files should be returned to the initial reviewers, usually within 2 months. Reviewers may request more than one revision of a manuscript, and alternative reviewers may also be invited to review the manuscript at any time. If it is accepted for publication, the manuscript is converted into the journal’s specific layout and the corresponding author is asked to check the proofs of the article. The corresponding author is primarily responsible for having ensured that the paper conforms to the journal guidelines. Before submitting manuscripts to Journal of Contemporary Tourism Research, all authors are required to check their manuscripts for plagiarism (using “iThenticate” or “Turnitin”) and send their similarity reports to the Journal. Journal of Contemporary Tourism Research provides immediate open access to its content on the principle that making research freely available to the public supports a greater global exchange of knowledge. All papers published in the journal are licensed under the Creative Commons Attribution-NonCommercial-NoDerivatives 4.0 International (CC BY-NC-ND 4.0). The author(s) and copyright holder(s) agree that all users have free access to the articles published in this Journal. To protect copyright and the rights of the Journal licensed under a Creative Commons License, authors of the accepted articles agree to share their works with others with the full acknowledgement of the works. Türk Turizm Araştırmaları Dergisi (Journal of Turkish Tourism Research) applies the Creative Commons Attribution-NonCommercial-NoDerivatives 4.0 International (CC BY-NC-ND 4.0) to all articles published. This work is licensed under a Attribution-NonCommercial-NoDerivatives 4.0 International (CC BY-NC-ND 4.0).